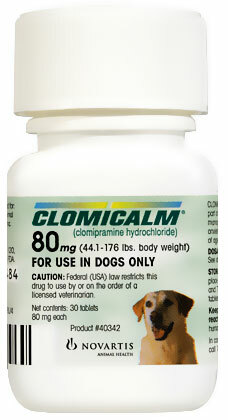 Clomicalm® is to be used as part of a comprehensive behavioral management program to treat separation anxiety in dogs greater than 6 months of age. Inappropriate barking or destructive behavior, as well as inappropriate elimination may be alleviated by the use of Clomicalm tablets in conjunction with behavior modification. Toxicology: Clomicalm tablets are well-tolerated at the recommended dosages. Side Effects: Lethargy may be common in the first couple weeks, but this will decrease as the dog becomes accustomed to the medication. Vomiting is also common, and can be decreased when administered with food. Diarrhea, increased thirst and elevation in liver enzymes may also occur. Warnings: Not for dogs with hypersensitivity to clomipramine or other tricyclic antidepressants. Do not use in combination or within 14 days of a monoamine oxidase inhibitor (MAOI) such as selegiline (Anipryl) or amitraz (Mitaban or Preventic collars). Do not use in male breeding dogs, as testicular hypoplasia has been shown at elevated dosages. Not for dogs with a history of seizures. Precautions: Use caution in dogs with a history of cardiovascular or liver diseases. Safety has not been established in pregnant or lactating females.